The Boston Events Calendar for July gets off to a rousing start with Harborfest, the big annual July 4th Boston Pops concert at the Hatch Shell, and spectacular fireworks over the Charles River - but that's just the beginning of the month's fun events! Exciting concerts this month include Foo Fighters, The Eagles, Steely Dan & The Doobie Brothers, Kesha and Macklemore, Weezer & Pixies, plus lots more. Other top July attractions include Bastille Day celebrations, Free Friday Flicks on the Esplanade, Shakespeare on the Common, and even a Pizza Festival on City Hall Plaza. The weather is usually gorgeous, and events move outdoors. Cheer the Red Sox at Fenway Park, head to a nearby Boston beach, take a whale watching cruise from the downtown waterfront, and enjoy some of the many free concerts, art festivals, and other outdoor July events. Cirque du Soleil Returns to Boston! Cirque du Soleil's Luzia comes to Boston on June 28 for 5 weeks of dazzling performances at Suffolk Downs. With its unique blend of acrobats and dancers, gorgeous costumes, original music played by a live band, and stunning choreography, Luzia transports you to a magical of light and water inspired by Mexican culture. Suffolk Downs is easy to reach on the subway's Blue Line. Celebrate America's birthday on July 3rd and 4th with the Boston Pops Fireworks Spectacular, America's premier Independence Day celebration. From the opening notes of the National Anthem to the closing bursts of real cannon fire as part of the 1812 Overture, the July 4th Boston Pops concert at the Hatch Shell celebrates Independence Day in spectacular fashion, followed by dazzling fireworks over the Charles River. Special guests this year are expected to be announced soon! The concert on the day before, July 3rd, gives music lovers a chance to enjoy familar favorites (but no fireworks at the end). Pops Conductor Keith Lockhart leads the Boston Pops Esplanade Orchestra during both concerts. Nearest T stations: Depends on where you plan to sit - use Red Line/Harvard Square if you plan to be on the Cambridge side, and Green Line/Arlington or Red Line/Charles-MGH for the Boston side. Boston's most spectacular firework display of the year follows the Pops Concert on the 4th. Watch from tall buildings (Top of the Hub view is spectacular - but reserve early! ), rooftops, or the banks of the Charles River. 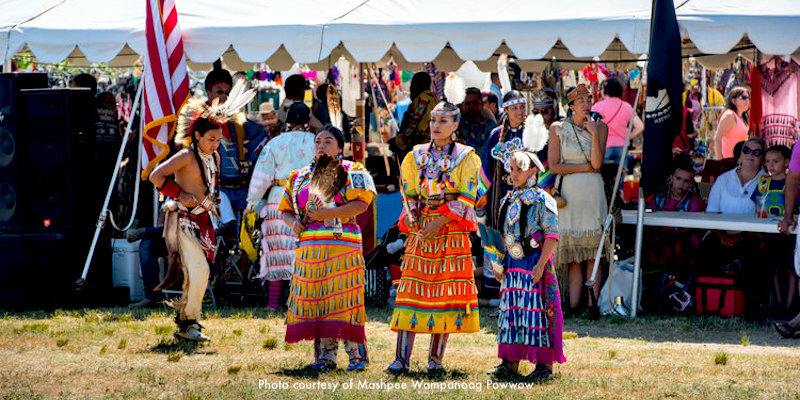 The 97th annual Mashpee Wampanoag Powwow takes place on traditional tribal lands on Cape Cod just an hour south of Boston. Dancers, drummers, and other participants celebrate Mashpee Wampanoag culture during this 3-day historical festival with dancing, drumming, games, food, art, jewelry, and crafts. Special events include a Fireball spiritual healing ceremony on Saturday evening at sundown, and a traditional Clambake and crowning of the Mashpee Wampanoag Powwow Princess on Sunday afternoon. The Mashpee Wampanoag Tribe is part of the Wampanoag Nation of people living in Southeastern Massachusetts and Eastern Rhode Island for more than 12,000 years. Find out more about the Wampanoags from the Stone Age to the present by visiting the Mashpee Wampanoag Museum (414 Main Street, Mashpee, MA; website). Harborfest is Boston's gala celebration of American Independence, July 4th, and the joy of summer in Boston. Revolutionary War reenactments, cruises, exhibits, walking tours, and more exciting events showcase Boston's colonial, Revolutionary War, and maritime history. Cost: Free to pricy - depends on the event! Some venues request donations. One of the most popular summer Boston events, Commonwealth Shakespeare Company presents Richard III, one of the Bard's darkest tragedies about a stunningly flawed king, in this year's Shakespeare on the Common. Bring a blanket or low folding chair, perhaps a picnic basket, and get ready to enjoy a magical evening of free theater under the stars. You can also rent a chair for $5, plus a $5 deposit that you will get back when you return the chair. Bring your own food, or purchase something tasty from the vendors who will be onsite for the occasion. Toilets are available at the nearby tennis courts. When: July 18 - August 5 at 8pm on Tuesdays through Saturdays, 7pm on Sundays, plus a 3pm matinee on August 4 (note - no performances on Mondays); performances run about 2.5 hours; heavy rain and lightening storms can cause cancelations for safety reasons, so if in doubt, call the weather line at 617-426-0863. Cost: Free admission; chairs in a small special priority section near the stage are available in return for a donation of $75 or more, with proceeds to benefit CSC. Indulge your passion for baseball by going to see the Boston Red Sox at Fenway Park. Visiting Boston in July? You'll find lots of fun ways to see the city - hop on hop off trolleys, duck tours, lots of themed sightseeing cruises around the Harbor. Or, if you want to have a sightseeing adventure beyond Boston, head out to the Stellwagen Bank National Marine Sanctuary on a special 3-hour whale watching cruise to get close-up views of humpback whales, Atlantic dolphins, sea birds, and friendly porpoises from the three outdoor decks. It's a different world! Boston's expansive City Hall Plaza turns into a giant picnic ground when the Boston Pizza Festival returns on July 7-8, bringing all-you-can-eat pizza, entertainment such as pizza tossing shows and live music, adult and other beverages, and games to this family-friendly celebration of summer. Fans devoured over 27,000 pizzas by top local pizza makers such as Pizzeria Regino, Bricco, Antico Forno, Babbo, and Serafina at last year's event. Tickets: $35 in advance, or $45 day of event. Enjoy free outdoor concerts at the Hatch Shell on Boston's Esplanade throughout July and August. This series of family movies sponsored by WBZ NewsRadio 1030 and the Department of Conservation and Recreation (DCR) provides the perfect excuse to grab a blanket, pack a picnic, and head for an evening of entertainment under the stars. Queen Mary 2, the largest and most expensive passenger ship in the world and crown jewel of the Cunard shipping line, will sail into Boston's CruisePort at noon on July 4th as part of a cruise originating in New York. The Queen Mary 2 will stay in Boston overnight for the July 4th fireworks on the following night, and depart on the 5th. Planning to stop by to see the Queen Mary 2? Treat yourself to a meal or drink at one of the nearby Seaport restaurants and bars overlooking Boston Harbor. Boston Harbor Hotel's popular "Summer in the City" series lets you kick back and enjoy free music and movies overlooking the waterfront throughout the summer from June 7 until August 31. Listen to music between 6pm - 10pm as musicians perform on the Blues Barge on Tuesday (Pop-Soul), Wednesday (Rat Pack), and Thursday (Blues Barge). On Fridays, enjoy music (starts at 4:30) and Movies By Moonlight - your favorite classics projected on a large screen over the Harbor- starts at dusk. Combine these events with a drink at the hotel's Rowes Wharf Sea Grill and dinner at Meritage for the perfect summer evening. Figment brings an explosion of creative energy to the Greenway each summer for one weekend of participatory art and culture on July 28 (11am-11pm) and July 29 (12 noon - 6pm). This free event transforms the entire length of the Greenway from the North End Parks to Dewey Square (across from South Station) into a massive collaborative artwork. Expect to see performances, sculptures, activities, art, photographs, dance, and more. Bring sunscreen and a water bottle, and come have fun! Watch our local soccer team, the New England Revolution, bring men's soccer to a new level at Gillette Stadium. Only 1 home game is scheduled for July - so don't miss the chance to see the Boston area's professional men's soccer players in action! Find out more about Boston discount cards, and how they give you big savings on top attractions. This New England Coastal Tour day trip gives you spectacular views of the beautiful New England coastline along Massachusetts, New Hampshire, and Maine. You'll get to visit historic Nubble Lighthouse, enjoy lunch and leisure time in quaint Kennebunkport, visit Hampton Beach, and see all the charming villages along the rocky coastline as you cruise along in a luxury climate-controlled coach. Boston hotel pickup and dropoff included. ICA Boston presents We Wanted a Revolution: Black Radical Women, 1965-85 (June 27 thru September 30). 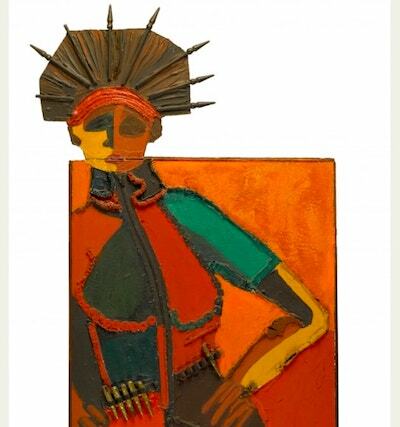 This show focuses on the work of black women artists, and examines the political, social, cultural, and aesthetic priorities of women of color by highlighting their foices and experience. You'll see a wide variety of genres, including performance, film, video art, painting, photography, and more. A visit to the Institute of Contemporary Art to see this show gives you the perfect excuse for exploring the South Boston Waterfront and nearby Fort Point areas. This is the city's fastest-developing (and possibly trendiest) neighborhood - and with several top museums, Harborwalk, the Blue Hills Pavilion, and more restaurants than you can count (with new places opening almost every month), there's plenty to do here. Bastille Day, the French national holiday celebrating the storming of the Bastille prison, the beginning of the French Revolution against the tyranny of the monarchy in 1789, and the birth of modern France occurs on July 14. Boston's French Cultural Center celebrates it on the preceding Friday by blocking off Marlborough between Berkeley and Claredon for a huge street party. Francophone acts Ben l'Oncle Soul and Dabe Touré will provide plenty of high-energy music for dancing in the streets. Complimentary French hors d'oeuvres and desserts are offered. Delicious French food from the city's top French restaurants drinks including wine will be available for you to purchase. Come celebrate with 2,000 other revelers, sing "La Marseillaise," and raise your glass to Liberté, Egalité, Fraternité in support of people throughout the world. Visit The West End Museum, one of Boston's small and fascinating history museums dedicated to preserving the history of this neighborhood prior to demolition/reconstruction in the 1950s, to see a fascinating exhibit about how public transportation has shaped life in Boston since the first English settlers arrived in the early 17th century. Boston Comic Con gives you the chance to meet and chat with over 200 top graphic novelists, super hero artists, and developers of anime, movies, games, and toys, plus about 50,000 fans. Celebrity guests and artists include Meat Loaf, Ming-Na Wen, Karl Urban, Stan Lee, Drew Struzan, and many more! Plenty of dealers will be present also, so indulge in this opportunity to see your own graphic/comic heroes and add to your collection. Outdoor concerts take place all over the city during the summer - and Berklee College of Music gives over 400 of them between June 7 and August 31. Music ranges from jazz to classical, Latin to funk, folk to world, and are free. Why pay full price? Check Goldstar's listings for half-price & discount Boston tickets for July - an easy way to save! Find even more half-price tickets for July! The Boston Landmarks Orchestra's weekly free summer Esplanade concerts attract large crowds to the Hatch Shell each July and August with its mix of classical, traditional, modern, and contemporary music. Concerts start at 7pm and run about 2 hours. Bring and blanket or low folding chairs to sit on, and a picnic dinner. Not Sure about Boston Neighborhood Locations? This neighborhood map should help you get oriented. You can find a list of top attractions in each neighborhood here. Need a more details? Here are our favorite free and low-cost Boston maps. Boston's North End Italian Feasts and Festivals draw huge crowds to this historic neighborhood. You can smell the wonderful food, hear the music, and sense the excitement as you walk across the Greenway to Hanover Street, where many of the celebrations take place. These festivals take place almost every weekend throughout the summer. Interested in staying in the North End? Check rates at Bricco Suites, in the heart of the neighborhood, and the waterfront Yacht Haven Inn and Battery Wharf Hotel. Enjoy colorful open-air market booths selling crafts, lucky bamboo, traditional silk clothing, and lots more, plus Chinese folk dances, Lion dances, and martial arts on stage on the Greenway in this mid-summer festival in Chinatown. A great excuse for a tasty meal in one of these fun Chinatown restaurants. Enjoy this free fun family activity - movies under the stars in Prudential Center's lovely South Garden (go up the escalators from Huntington Ave, and the garden is to your right; from Boylston, it is on your left). Over 500,000 spectators gather at Revere Beach during the course of the 4-day New England Sand Sculpting Festival to watch 15 renowned master sculptors from around the world work their magic with individual 12 ton allotments of sand imported from Hudson NH, plus water. The sculptors compete for $14,000 in prize money, and the sculptures they create will amaze you with their detail and artistry. With music performances, a food truck festival, amusement rides, and crafts activities on site as well, you'll find plenty of family entertainment - and don't forget to bring your swimsuits, sunscreen, and towels for the beach! Fireworks provide the grand finale for the sand sculpting festival. Enjoy free outdoor movies, croquet, and celebrations at Christopher Columbus Park in Boston's North End. Lawn Games - Saturdays through August 25, noon - 4pm - Corn hole, giant jenga, ladder golf, & more! Lawn on D, a playground for adults located behind the Convention Center in the South Boston Waterfront, is the site of beanbag and other games plus art installations throughout the summer, along with a rotating series of food trucks. But even when no special events are underway, the Lawn gives you a perfect place to just chill under the summer sun. A visit to Lawn on D provides the perfect excuse to sample one of the many new restaurants in the Seaport and Fort Point areas of the South Boston Waterfront. For Boston Harbor views while you dine, visit a Seaport restaurant. To try the creative cuisine of some of Boston's most innovative chefs, head to a Fort Point restaurant. Head over to the Commandant's House Lawn in historic Charlestown Navy Yard at 6pm on Thursday nights from June 28 - August 2 for free concerts given by musicians from Berklee College of Music. Each week features a different tradition: Brazilian, Alt Rock, Latin, and more. Bring a blanket or lawn chair and settle in for a relaxing concert under the stars. Food will be available to purchase nearby; no alcohol permitted. 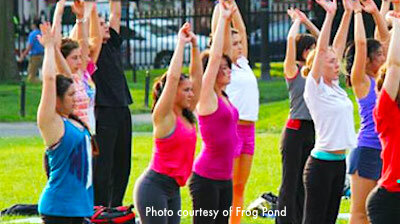 Dropping in on free summer yoga sessions at Frog Pond (next to the carousel) on Boston Common is part of what makes Boston fun in the summer. Instructors (an eclectic mix of writers, musicians, athletics, cyclists, runners, and more) welcome students of all levels. Fun Free Fridays give you free admission to top Massachusetts cultural venues throughout the summer, thanks to the generosity of Highland Street Foundation. A different selection of destinations offer no-cost access each Friday from the end of June through the end of August. Please note: We are awaiting confirmation that this event will take place in 2018 - so stay tuned! Outside the Box, Boston's largest performing arts festival, transforms the Common by erecting six stages and tents where over 100 local artists and groups stage theater, dance performances, and music for 5 days from July 13-17. Most events take place on Thursday through Sunday from 12 noon - 9pm. With so much going on at the festival, you can just walk around Boston Common and find the performances you like best. But if you want to plan ahead, check the festival's schedule on the Out of the Box website. Boston's waterfront hotels - great views, great memories!